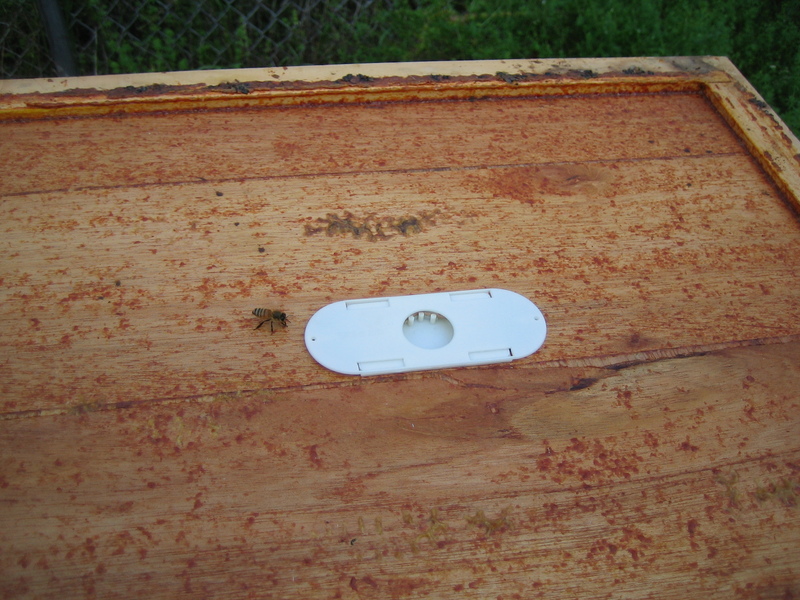 I haven’t updated my blog in a while—mostly because I haven’t really inspected my hives in a while. I ended up hurting my shoulder over the summer, which severely limited the amount of lifting I could do. 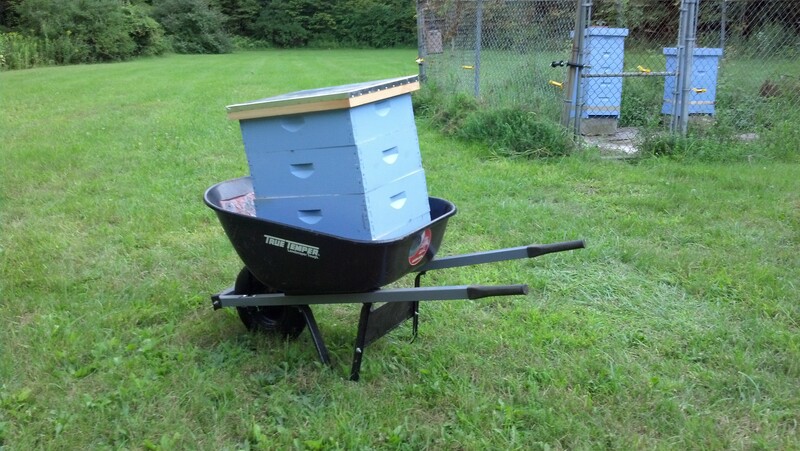 Luckily, my husband was kind enough to brave the bees and at least put empty honey supers on, to make sure the bees had enough room and wouldn’t swarm. 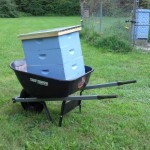 There’s a lot to say about harvesting honey, so I’m going to break it down into a few posts. This one will focus on actually getting the honey away from the bees. 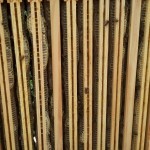 Second will be extracting the honey from the combs, and the third will be bottling the honey. 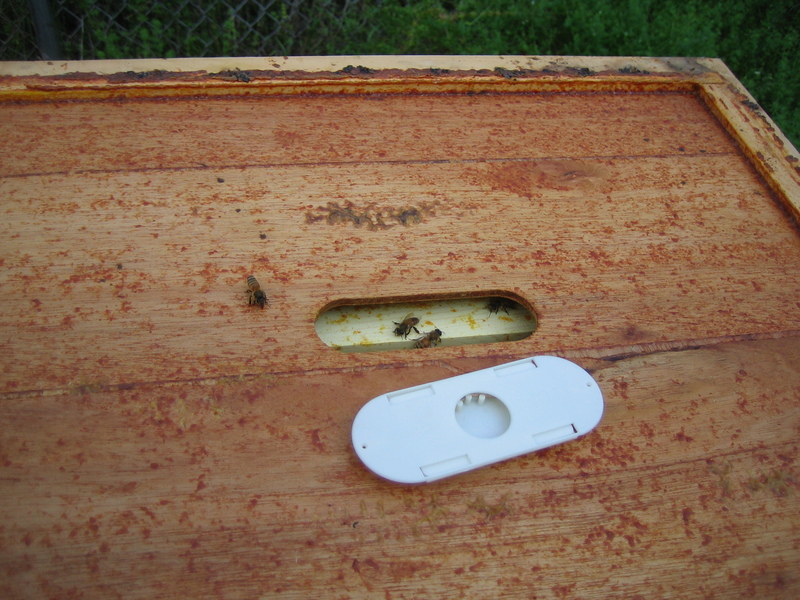 Before harvest–the top four boxes are just about full of honey. If you’ll recall, New Vulcan was a new colony this year, replacing the one that died over the winter. Since they’re new, I won’t be taking any honey for them this year—want to make sure they have plenty to make it through the winter. So this story will be focusing on Andoria. 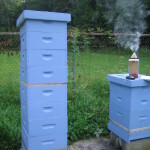 A medium super will yield between 30 and 40 pounds of honey. A quart of honey weighs 3 pounds, so that’s 10-13 quarts of honey per super. With four supers full, I conservatively estimated I should get about 120 pounds, or 40 quarts, from this one hive. Yum! 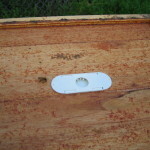 So again, the first step is getting the honey supers off the hive and empty of bees. There are several methods of doing this. One is the Porter bee escape. 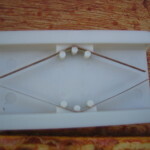 This is essentially a one-way door: you put it in the hole in the inner cover, then place that below the honey supers and above the brood boxes. 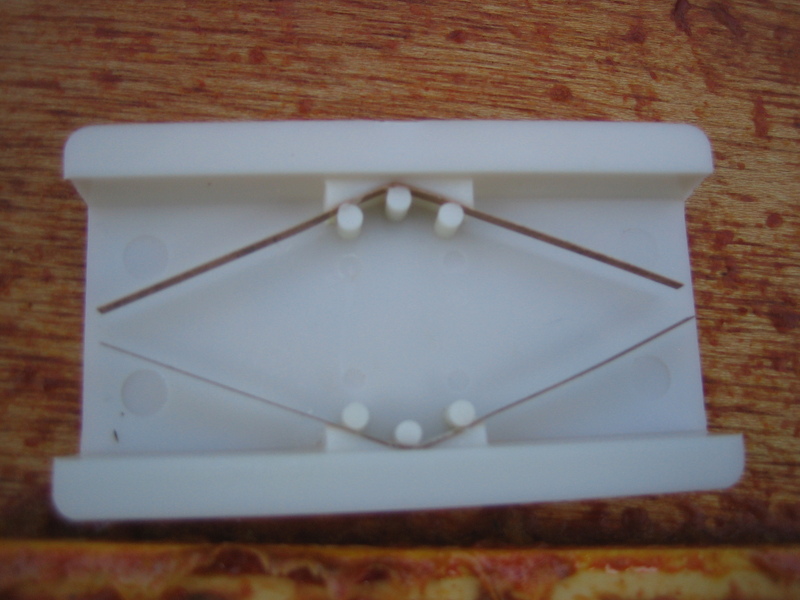 The bees will (in theory) be able to leave the supers and enter the brood chamber through the bee escape but not be able to get back in. 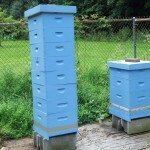 Within a day or so, the supers will (again, in theory) be empty of bees. 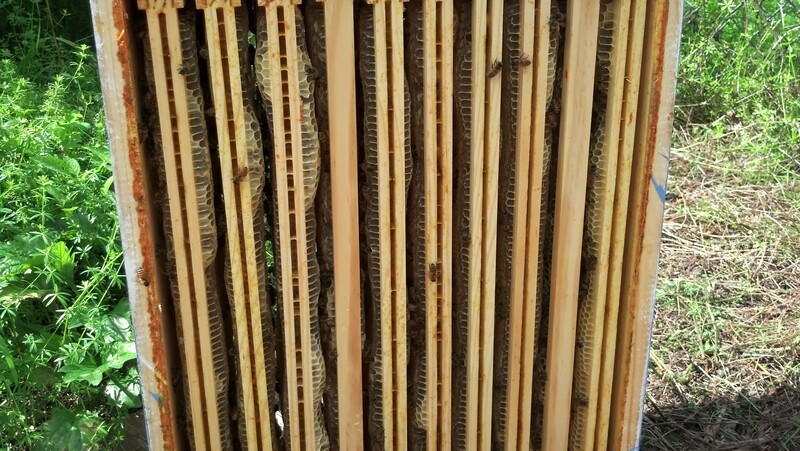 Interior of the Porter escape–bees go up in the center, then out through the spring “doors” on either end. A second method is essentially the same concept: a triangle escape board. You put this in the same position (between the supers and the brood chamber), but it’s instead a large piece of wood that apparently acts somewhat like a maze for the bees. It somehow works on the principle that bees will only turn in one direction when they come to a gap. I still can’t quite visualize it, but it apparently works pretty well in getting the bees to leave the supers and not be able to re-enter. Another method is a fume board, which you put on top of the supers with some sort of smelly chemical that drives the bees down and out of the supers. Two of the big chemicals: Bee Go and Bee Quick. Bee Go smells like a decaying carcass. It works, but if you get it on yourself or your clothes, you may permanently smell like a decaying carcass. I’ve been told that Bee Quick works just as well, and it at least smells pleasantly like almonds. 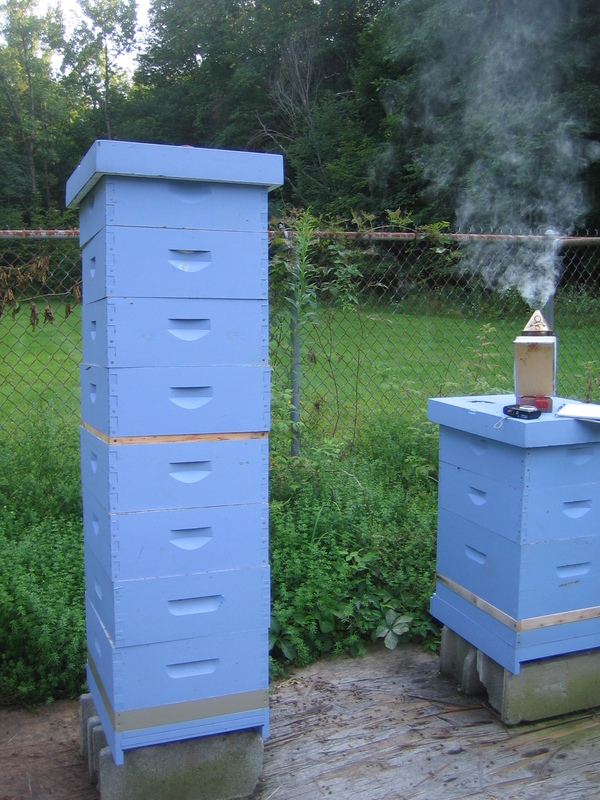 One thing to note: I’ve been told that fume boards work great when the weather is great, but not so much when the weather is poor; the bees will apparently take a bad smell over bad weather and not leave. I, of course, chose what seemed to be the cheapest, simplest route: the Porter bee escape. Since the plan was to extract on Saturday, I placed the escape after work the preceding Wednesday. I figured I’d take the supers off Friday evening, so that would be the bees a couple of days to leave the supers through the bee escape. 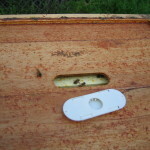 I proceeded to remove the honey supers on Friday. In the meantime, I’d been reading about how poorly Porter bee escapes work. As I neared the hive, I heard an awful lot of buzzing coming from the supposedly empty supers, so I figured the escape hadn’t worked. 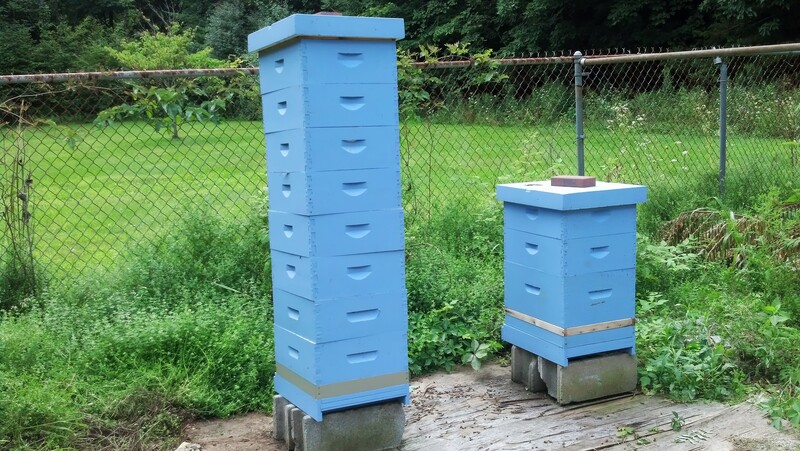 In fact, the escape had worked so poorly that the bees trapped in the supers thought they were a queenless hive and began making emergency queen cells. Brilliant. I ended up having to go frame by frame, brushing all the bees off each frame. Oh well. It worked—just took much longer than expected. For next year, I plan on getting both a triangle escape board and a fume board, to use accordingly depending on the weather. I highly DO NOT recommend going with the Porter escape, in spite of the low cost. In this case, you truly get what you pay for. It turns out that the supers weren’t quite as full as I’d thought, either. There was quite a bit of uncapped nectar in some of the frames, which you can’t extract or it will ferment and ruin your honey crop. But there was still a good 25-30 frames full. So I still expected to get a decent crop, just not quite as much as I’d previously calculated. Up next: extracting the honey! Four supers ready to load into the car! Neat stuff, thanks for sharing your bee adventures!